Every week or so, we’ll be writing about our favorite handmade, vintage, and indie finds of the week. Find great Etsy coupon codes for stores like these on our Indie Coupons website! Want to share something with us? Leave a comment below. It’s that time of year again where love fills the air and gifts of affection are given to the treasured people in our lives. Valentine’s Day reminds many of loving couples who have a special bond with each other, and here we have a list of couple-friendly gifts that lovers can enjoy on this holiday! Valentine’s Day doesn’t have to be all about customary red roses, candlelit dinners, or heart-shaped boxes of chocolates. As time goes on, feelings grow as you learn more about your lover and spend more time with them. Why not move up a step from traditional gifts to more considerate and meaningful presents? Instead of separately purchasing gifts for each other, you can discover a world of gifts just for couples. Share any of these wonderful gifts from unique Etsy crafters with the apple of your eye just like you share the love (or like if you’re a new couple) you have for each other! Snuggle up on a couch, pop in a favorite movie, and dig into a carton of decadent ice cream with your sweetheart with Milk & Honey’s “His and Hers” ice cream spoon set this Valentine’s Day! 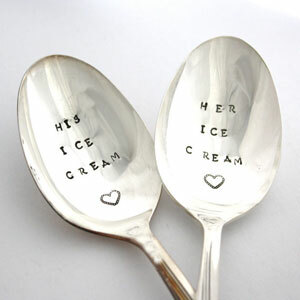 Engraved with “His Ice Cream” and “Her Ice Cream”, you won’t be fighting over a spoon or the last bite of ice cream. With a small heart below the hand-stamped words, this spoon set makes for a sentimental gift for couples on Valentine’s Day. Slip into a pair of WhiteNoiseMaker’s his-and-hers crocheted slippers! Made for indoor use, these comfy and swanky slippers are a fun way to show off your couple status and stay warm during those frigid seasons. Want to take your his-and-hers slippers outside? Apply a latex coating on the bottom of these slippers to wear them outdoors with your lover. If you and your beloved are in a long-distance relationship or just like to keep in touch through letters during business trips, then The Spinning Paintbrush’s hand-painted wooden pens are a great way to stay connected through writing. Made with rosewood, the red tints in the wooden pens enhances the romantic atmosphere that surrounds Valentine’s Day, making this pair an amorous gift for couples. The “her” pen is hand-painted with shimmery roses and each pen has an adorable key-to-my-heart charm attached at the ends, adding more to the meaning of Valentine’s Day. 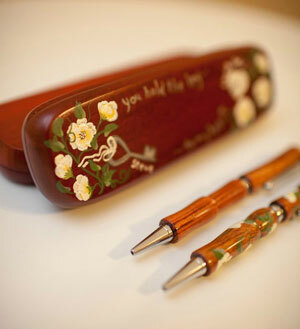 Both pens are placed in a romantic, redwood-stained case. 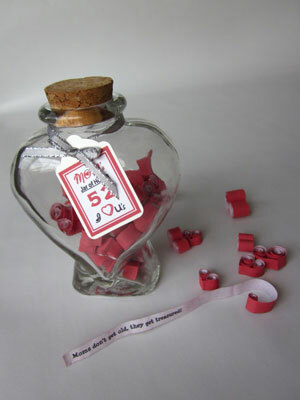 Remind the love you have for your darling with Rychei’s heart-shaped bottle with 52 personalized messages! Each slip of paper is shaped into a heart so that your sweetie can unravel the secret message inside. For 52 days, you’ll be able to give a little special love reminder to your other half. Whether you would like to use pre-made messages or put your own loving thoughts onto these slips of paper, you’ll have a heart filled with adoring messages for Valentine’s Day! 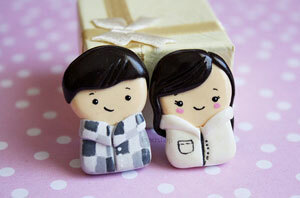 Create your own couple’s figurine at Ku-Ki Shop! Send in a photo for reference, and Ku-Ki Shop will mold the perfect, miniature versions of you and your partner in charm form. From cellphones to necklaces, you can add these darling and quirky charms to any desired area. Ku-Ki Shop customizes these figurines to a T, so you can request different colored or styled clothing, physical features, and many more options! 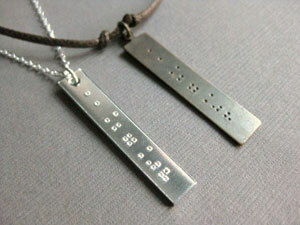 Have your anniversary date hand-stamped in Braille on Informal Elegance’s specialized necklaces! On an extended piece of sturdy aluminum metal, your special date will be in a secret language that only you and your love will know. Informal Elegance adds a feminine flair on the “her” necklace delicate silver chain and a cool and manly brown cord for the “his” necklace. Fill in these cutesy and flirty love coupons from Sweetheart Circle and present them to your adoring companion for a surprising treat! From massages to a home-cooked meal, you can fill the blanks on these coupons with anything imaginable. 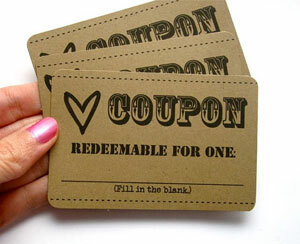 You can also give blank love coupons to your mate to add a daring twist to your Valentine’s Day! 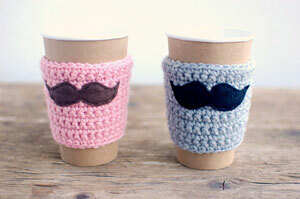 Moustaches are becoming a new trend nowadays and they’ve made their way onto The Cozy Project’s his-and-hers coffee cozies! Playfully colored to represent girl and boy, these simple yet quirky coffee cozies are excellent for keeping your hot beverages warm for longer and protect your hands as well. You can enjoy a cup of coffee at your favorite shop with your cutie on Valentine’s Day with these fun his-and-hers coffee cozies! Express your eternal devotion to your spouse, fiance, or boyfriend/girlfriend with an engraved love padlock from the Germany-based shop — Schmuck Dicht! You and your partner’s name and a meaningful date will be engraved on a golden padlock, which is ornamented with a whimsy red heart. 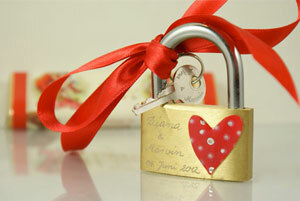 Tied to the padlock’s hook with a colorful ribbon of your choice is a key with names engraved on it. Take your lover on a romantic date and find a special location to attach your padlock, bury it, or even toss in the ocean! Like counting down to the days until Christmas, couples can countdown to the days until Valentine’s Day with My Scrapbook Studio magnetic Valentine countdown containers! Stuff these 14 containers with love coupons, candies, or affectionate notes and stick them onto the fridge. Let your dearest open one of them for a special surprise each day until Valentine’s Day! My Scrapbook Studio does the hard work for you and has slipped love notes or love coupons (your choice!) into these containers so you can enjoy them right when they arrive. As you can see, there’s a wide stretch of gifts that extend from conventional ones. Celebrating Valentine’s Day doesn’t have to stop at presenting each other gifts, though! Go on a picnic or a bike ride to a beautiful park. Take a canoe out on a calming lake and get some exercise in while spending quality time with each other. Valentine’s Day is all about LOVE! Go out there, take the day off work, and dedicate this day (and bring a special gift of course!) to the love of your life. Happy Valentine’s Day to those in a loving and committed relationship! Written by Emily Nguyen, a freelance writer and core contributor to NerdWallet Shopping.